How to write an essay on terrorism well? Specific topic requires specific preparations and knowledges. See where to get both. Be ready to create your own text on this serious humanity problem of modern world. Which Type to Choose for Terrorism Essay Writing? That seriously depends on how exactly your topic sounds. If it wants you to describe a history of terrorism, go for expository essay. To analyze main reasons of modern terrorism’s existence, use analytical type. Argumentative and persuasive essays are great for controversial topic variations. For instance, when it looks like “Do you agree that terrorism in a particular country is a problem of local government?” argumentative essay fits the best. Yet it is often difficult to define one and only type for each particular case. An important thing comes here to help. Making a good plan is a huge step towards getting a text worth reading. Before you start noting key points, think about the topic once more. What’s the problem you want to write about? Is it connected to any act of violence? Special forces operation? Or any particular terroristic organization? Once you find the point, describe it in 3-5 sentences. Congrats, you’ve not just got a plan in your head. You have an essay introduction written already. Tip: while writing, try not to use any names or dates here, if possible. This will make your whole text more interesting for the reader. The main essay body is where you show the whole topic. This is a blank space for your mind and creativity. Use it according to the task of a heading. Opinion text? Describe your opinion. Concentrate on your personal thoughts and bring them to the text. For instance, they ask you “What do you think of the rule: “No negotiations with terrorists”?”. You don’t need to look for any statistics or psychological experiments data. Answer if YOU find the rule is right or wrong and why. Your vision matters. Argumentative writing? Mention all the facts, arguments, counterarguments and counter-counterarguments, proofs, statistics and research data you find reasonable. Your words need to be convincible and solid. 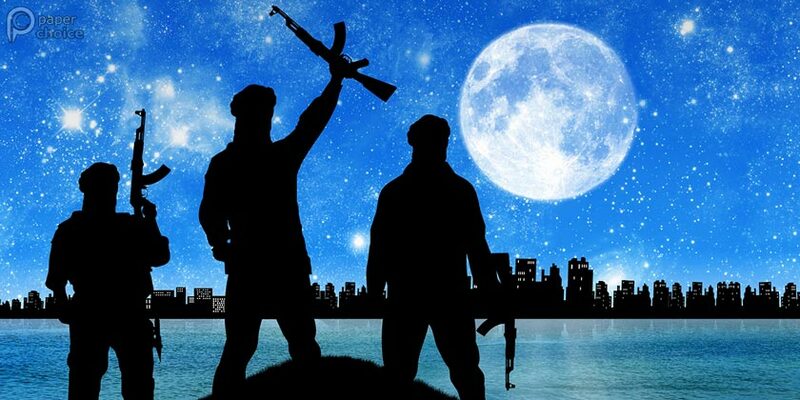 If the topic sounds like “Are modern Syrian rebels to be called terrorists?”, appeal to their ideology, to the history of their conflict with official government, to their acting and its consequences, and so on. The point is to prove your view is right. Expository essay? This is a type of essay where author’s personal attitude to the topic is not that important. Usually it fits if the terrorism topic is connected with history, “dry” ideology of any organization, laws, international initiatives and so on. Try to show your topic with as many specific details as possible. Looking at it from different points of view will make your text objective. Analytics? Well, it is time to mix opinions, experiences, predictions, hopes and fears. Remember that “to analyze” doesn’t mean “to describe”. Do not just retell facts about the main essay problem, but go deeper. For example, if to talk about counter terroristic measures in a particular country, find some info about the terror acts there and the way official institutes reacted onto them. Then, try to go “inside” the problem’s reasons, and predict further consequences if you can. Was the chosen solution the only one? What might be the next step of terrorists or government? Which problems will it bring “on top”? Being organized before and during writing process is a need. Think about what is your conclusion on the topic question before you start forming the main body text. And write your essay, analyzing why you got that thought as a result. Just one thing. Terrorism essay conclusion shouldn’t be a short retelling of the main body. This is a text result, so don’t repeat what you said before. If you don’t find words to end your text properly, then read it once more. Think what was your goal while writing and mention it before ending your essay. Topics connected with terrorism and counterterrorism are complicated. They often require touching not only law and government questions, but they need starting a social discussion about moral concepts of modern humanity, debates about the right to take away one’s health or life, the right to own a weapon and to use it. Depending on a special topic of your essay philosophical or religious elements might fit, too. If you think you need an assistance in essay on terrorism writing, you’ve got your helpful crew. Contact us right now by placing an order or by calling by phone. The number is above on this page, and it is available 24/7. We’ve got more than 1500 high quality writers available. Your ordered text will be 100% plagiarism free and totally connected to the required topic. Read our clients’ testimonials or contact us personally if you have any doubts in our writing service quality. Our friendly customer support managers are always ready to answer your possible questions, and to give you any other info you might need to successfully place and receive your order. Quality essay writing is what we’re good at. Helping you is our prior goal. Rated 4.5 | From 212 users.